Yes I'm a fool. I really enjoy shooting IR so bought a used K1 and had converted to full spectrum. Many of my vintage lenses perform in IR wonderfully but not many seem to pass UV well, so decided to give my Lensbaby optics a try. 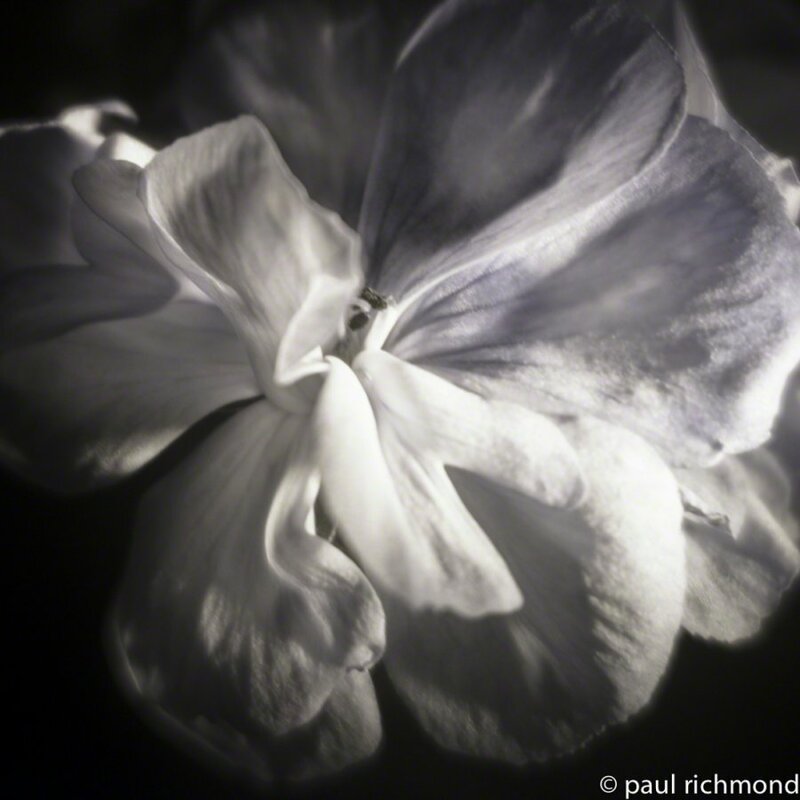 Tested the soft focus optic on a white geranium at F5.6 and am happy with the transmission response. 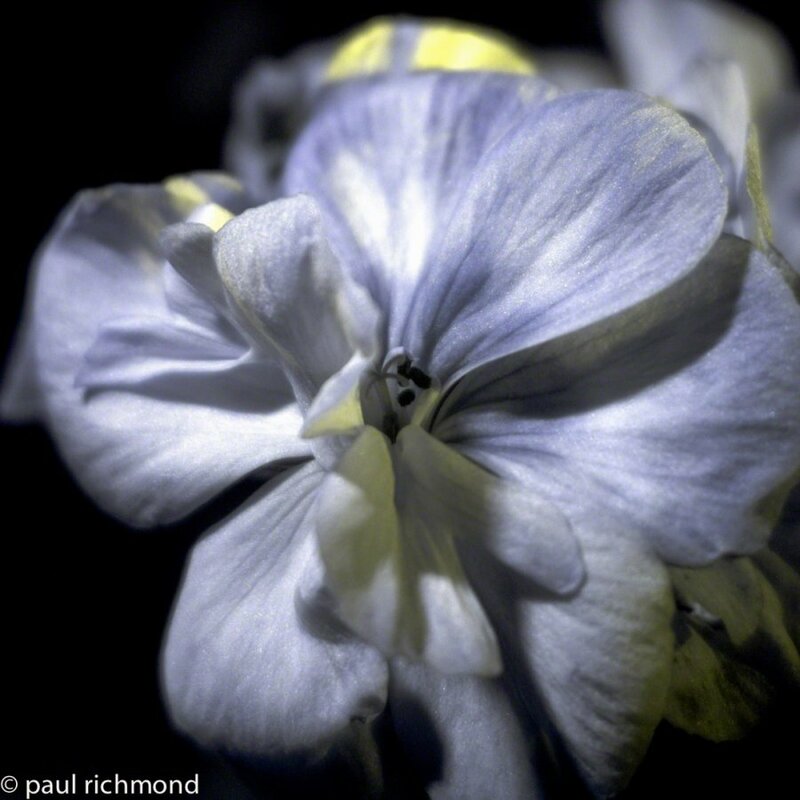 1st image is shot with U360 & Kolarivision hotmirror filter stack, FS converted speed-light, iso 800, 1/90th. 3rd with BG3/Kolari hotmirror and dedicated 365nm flashlight, iso 1600, 1/90th. All done with a 25mm tube. Very cool colors! Haven't taken any such shots myself, but I can imagine there's a lot of creative potential. Definitely room for creative potential. More, I'm seeing so much room in the learning curve. It's nice to be challenged again in both the creative and science world together. I can hardly wait till the wild flower season next spring to see what I might get. My first full spectrum conversion was a K01 & I liked it so much I wanted a FF to use with my other K1 lenses. I'm finding now few of my lenses seem to perform well with UV. So far my early Lensbaby optics seem best. I'm also seeing promising results with a couple old basic Zenitons I picked up here on the forum. It seems non-coated, minimal elements in single groups seem to work well. If you pick up a conversion, feel free to get back with me and I'll pass on info for what lenses I seem to have luck with. I'm sure coatings and particularly acrylic elements, and likely adhesives will screw with UV light. I wonder if something very simple like the DA40 would be good? Likely I won't pursue this anytime soon, but it would be fun to play. Could I ask the purpose for the Kolarivision Hot mirror filter stack - what exactly is that? TER-OR, not sure how the DA40 or any newer lenses would work. From what I've read coatings and cement limit the transmission more than good clean optics. I have read a few reviews though where people were having good luck with 5/4 and 6/5 combinations of older lenses. Also the Takumar 55 and 28 slow apertures seem to have very good results though I haven't tried them. I tried a coated doublet and didn't have as good of transmission as the Zenition 4/4 lens I tried. Also some of the old enlarging lenses have good reports. I tried a Nikkor 50/4 and Omicron 90/5.6 and want to experiment more for extreme closeups. Bob 256, it seems that many of the UV bandpass filters also permit an IR leak or spike at various wavelengths. Its chart shows it passes the high end of UV and visible light while blocking the IR side, though a custom white balance is still needed to bring colors into balance from the Pentax stock hot mirror that was removed. I don't have any way to scientifically measure the transmission but it looks to be close to Schott BG40. I am hoping to also try a Schott s8612 which permits a lower UV pass and better IR suppression so I might achieve higher shutter or lower iso for easier handheld work. Excellent images pcrichmond. Interesting about the Lens Baby working so well. There is good uv/macro info on the extreme macro UK website. Even how to easily modify a Vivitar 283/285 flash for uv. Extreme Macro Photography. Can't wait to see more of your photos. That makes sense. I don't know if it's available anymore, but I have used a Rosco Woods GLS filter which is a dichroic (interference) filter. It doesn't have all that good a UV transmission but doesn't pass any IR (see attached bandpass curve). Also since it's an interference filter, it has to have light come through it straight-on or its bandpass suffers. It is only available as a square glass filter so it has to be used in a filter holder in front of your lens. One other thought that might be of interest. 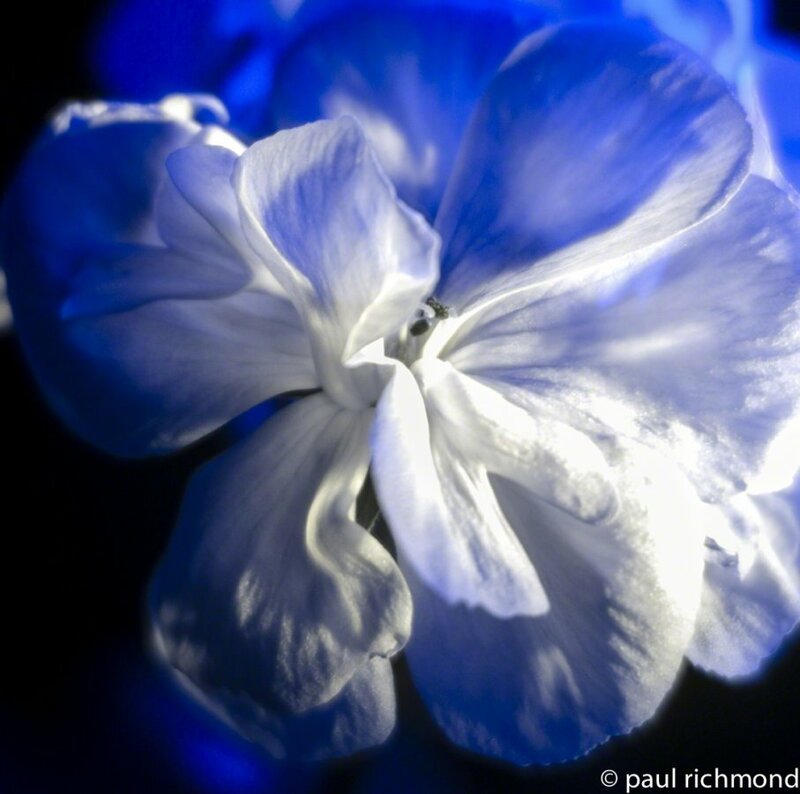 If you shoot using a UV source in a darkened room (UV source only illumination on the subject), you can get away without a lens filter and capture the same thing as would be captured using a UV filter over the lens. The only catch is that there might be some fluorescence due to the UV light which would also be captured unless blocked by a lens filter. 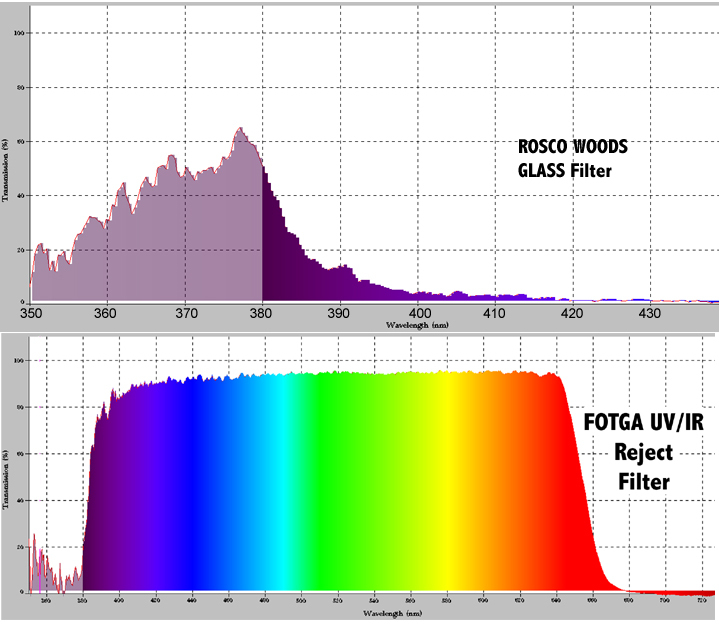 For visible light photography, I picked up some Fotga brand filters. I thought at the price they would be poor quality but they do a good job substituting for the UV/IR reject filter that's removed in the full-spectrum conversion (also attaching a bandpass I measured for those). ADDENDA: The Rosco filter is available, and in round sizes too from B&H. I don't know what the optical quality of these would be since they are for illumination sources, but if they're like the one I have, it's not bad - pretty flat glass. You'd still have to find a mount for these, but at the price they might be worth a try. Last edited by Bob 256; 12-28-2017 at 08:54 PM. Thanks barondla, I've referred to the extreme macro site many times researching tube and stack lens techniques. Never thought about it as a reference for UV. I'll have to give it another look. Bob 256, I had looked into Woods Glass but decided to go the dedicated bandwidth for lens filters due to price. Now, with the BH link, you've got me thinking about them again. I have a 250/125W Omni-pro halogen light I use in the field for light painting & was trying to figure out how to make it UV dominant. Looks like the Woods glass might be a perfect solution for this at a reasonable price. In my original post, I was meaning to suggest the Rosco filters as an over the lens filter, rather than a light source filter (though they can be used that way). Not sure how much luck you'll have with a halogen lamp. They don't produce that much UV in proportion to visible. If you want something portable, there are a lot of LED UV lighting sources out there now and it's pretty easy to make your own using UV LEDs. LEDs produce almost 100% usable UV and come in a number of UV wavelengths so you can tailor the source to your needs. Halogens are pretty good at IR but would be fairly inefficient used as a filtered UV source compared to LEDs. One place you can check for high output UV LEDs is MPJA. Be sure to use eye protection because the wavelengths and intensity produced by some of these LEDs is dangerous. Hey Bob 256, sorry I haven't responded earlier. Been offline for a while. I thought you meant to use the Woods Glass as a lens filter. For the price equivalence, I had decided to use bandwidth specific filters for more control over visible light. I had read somewhere that Woods Glass worked well though for light source control as it was an interference filter as opposed to absorption. I'd also read that Halogen light actually transmits enough UV to cause damage to the eyes and skin but that the glass casing used in modern lights cuts the UV down to safe levels. Gave it a test and there is almost no UV passed and minimal IR (3-5 stop cut). Most easily accessible LEDS sold as UV seem to be in the 385 to 395 bandwidth. I have a dedicated 365 UV LED light that cost just under 100US and even though the light quality is good (minimal visual) it is still weaker in output than I would like to experiment with. Most of the higher powered lights I have seen are used by mineralogist and cost more than I can afford right now, also they have enough power and lower bandwidth (about 320) to require extreme care for ones health. Guess I'll keep experimenting with my converted flash for high output light. Also just picked up a Domiplan lens for a good price. They are rated as being descent down to about 345, it seems that a good UV transmitting lens is more important for exposure than the output power of lightsource.